I never met my maternal grandfather; John Rea died in 1947, three years before I was born. My father always referred to him as having been ‘something of an entrepreneur’, so perhaps that is why I have always been interested in finding out more about him. He was a joiner, a carpenter and a successful building contractor, but these undertakings were secondary to John Rea’s foremost occupation – primarily that of a garage proprietor. In fact, my grandfather owned the first petrol-filling station in Northern Ireland; or so I was told. It was only once I retired, and began methodically examining my family’s history, that I set out to find if there was any substance to this claim beyond family lore. An online search of the Belfast Gazette showed that Rea’s Garage (under sole ownership) was started in 1923, but there was no further information. 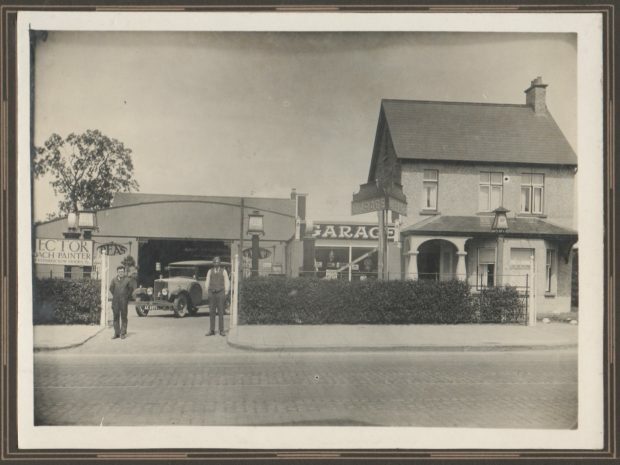 Sir – In reply to your letter enquiring about the location of the first service station in Northern Ireland, it was at 238 Upper Newtownards Road and was owned by my grandfather, the late Mr. John Rea. I enclose herewith an article from the ‘Irish Motor Trader’ that shows a photograph of this station and confirms that it was the first in Ulster. It appears that my cousin (now deceased) had written to one of the Belfast newspapers in response to a query about the first petrol station in the country. I now knew that the answer I had been seeking was in a publication called the Irish Motor Trader; but when? For some time my search was at a standstill, then, out of the blue, I found another newspaper cutting which seems to have been a response from the newspaper to my cousin’s letter. I am indebted to Mr. R.K. Gibson of Ballygowan, for enclosing with his letter ‘The First Service Station’ published in the corresponding column to-day, a page of the ‘Irish Motor Trader’ dated October 17 1929, which states that his grandfather, Mr. John Rea of Upper Newtownards Road, Belfast, was the first man in Northern Ireland to arrange a petrol and oil filling station. It so happened that one of my sons had just started working on a digitisation project in the British Library in London. He assured me that every magazine or journal ever published could be found in its collection. An online search of its holdings produced a reference to the Irish Motor Trader. A visit to London was imminent, so, a telephone call to the British Library confirmed that the volume I required was available and that it would be set aside for me to view upon my arrival later that month. When I arrived in the reading room the appropriate volume was already on my table. We reproduce on this page a photograph of the premises owned by Mr. John Rea at 238 Upper Newtownards Road, Belfast. Unfortunately this photograph does not disclose in detail the easy method which Mr. Rea has arranged for the filling up of cars at his petrol service station, but the layout is really excellent, and it reflects all the more credit on him when it is realised he was the first man in Northern Ireland to arrange a petrol and oil filling station. His garage, at the rear, is much more commodious than it appears from the photograph, as it extends a long way back, and in addition, he has bodybuilding and paint shops. His whole premises have been attractively painted and look really well. Mr. Rea has been in business here for about nine years, and carries on in conjunction with his motor trade a big business as a building contractor. At the recent T.T. Race, he built a private stand which was well patronised. And so there was a successful outcome to my search for evidence that my grandfather, John Rea, was indeed the proprietor of Northern Ireland’s first ever petrol-filling station.